Mention the name of Mort Cantor - one word comes to mind - VERSATILE! He is equally at home with an executive suit and tie, tennis shoes, the "mike", or baseball pants, socks, and cap. This small of stature, big of heart, wiry package of dynamite is a sports fan, athlete, writer, sportscaster, salesman, loving husband, father of four children - and friend. The legendary "Voice of Peoria Sports" is without a doubt one of the most prominent figures in Peoria-area history. A graduate of Woodruff High School and Bradley University, Mort was doing part-time sports work for the Peoria Journal Star while still in high school. In 1949, he became Bradleyí's first full-time Sports Information Director. In 1955, Mort started doing Bradley Basketball play-by-play with WIRL, continuing the B.U. play-by-play for a record 29 years. His accounts were exciting and factual; listening to Mort could be sheer enjoyment. Through the medium of radio, he entered the homes of thousands of fans, making listening to a Bradley game something special. A vice-president and general manager of WIRL until 1983, he continued broadcasting at WXCL until 1985, and then hosted a successful talk show on WTAZ for three years. He is a member of the Bradley U. Hall of Fame and Woodruff Hall of Fame. 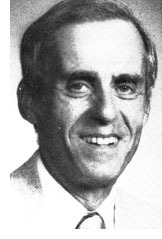 Co-founder of the Bradley Chief Club, he served for five years as president, and he is a charter member and first broadcaster inducted into the Illinois Basketball Coaches Association Hall of Fame. An avid softball fan, Mort co-founded and managed Peoria's first Women's Major Fast Pitch Softball team since the 1960s. He is currently general manager and head coach of the East Peoria Avanti's, one of the nation's top fast pitch women's teams. Mort's was also President and Chief Executive of the Better Business Bureau of Central Illinois. Thanks for the memories, Mort, and your contributions to our sports history.